So, you've got a new kiddo around the house, and it's a very exciting time. But you can't help but think about the future, too. Just what kind of hero is your kiddo going to grow up to be? Is he going to be a super-sized brawler? You know, big, green, and muscle-bound? Or, maybe he'll be a different kind of hero. You know, more svelte. Swinging through the city, utilizing an advanced intellect, high tech gadgetry, and enhanced senses. Ahhh, there's just no way to know! So, we say prepare for both eventualities. 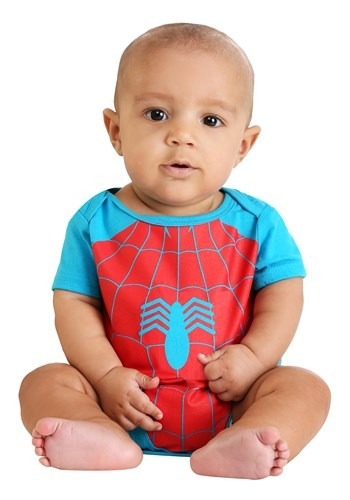 And we have just the thing for that, too, with this Marvel Spider-Man and Incredible Hulk Onesie 2 Pack. One set will have him styled like the super strong Hulk. And the other will have him dressed up like the slick Spider-Man! Both feature a perfectly cute comic book style, and best part of all, there's no commitment required. He can wear 'em both, and still grow up to be an entirely different hero altogether! Marvel Comics officially licensed, this set comes with 2 onesies. Each onesie is graphic printed with comic costume details and are made with a 60% cotton and 40% polyester blend. They secure with snap closures, and are machine washable for easy care. We've got your infant covered with this onesie set, but of course we have plenty of costume and accessories for when they're a little older, too. We think costume fun should always be a part of growing up, which is why we're your one stop shop for all kinds of comic book fun!